I still shout “Diggers!” every time I see something big and yellow with caterpillar tracks or a scoop on the front, but I do it quietly and inside my own head these days. 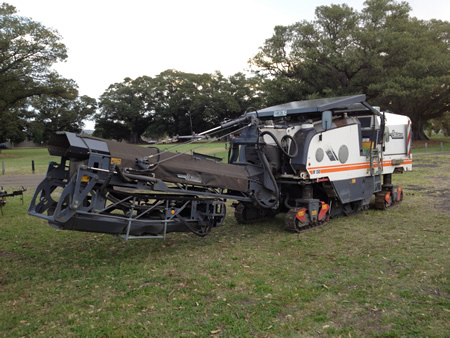 This thing, the thing that claws up the bitumen and hurls it backwards into a hopper like some Death Star tank, is particularly awe-inspiring. 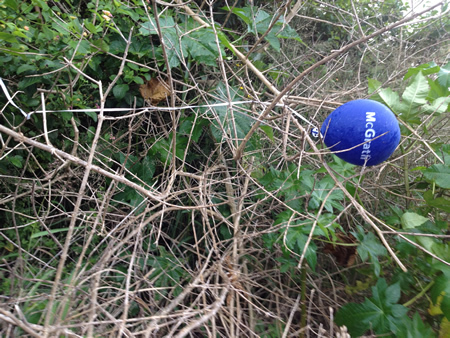 Here’s one I tracked down in its natural environment, grazing in the park. 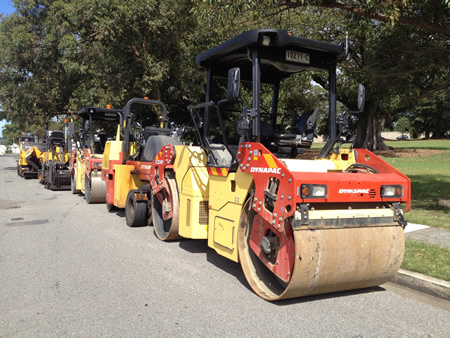 You can see that from the MacLean taxonomical perspective, “Diggers” is a very broad group that encompasses almost every large vehicle (i.e. 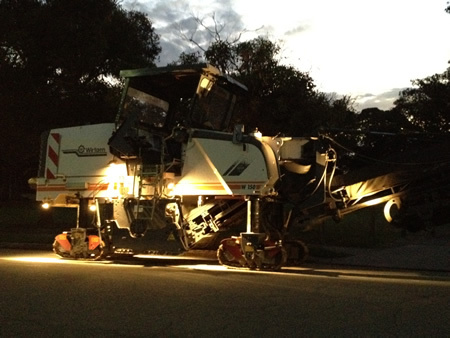 those with big wheels, caterpillar tracks, a scoop or some large vessel on its rear). I don’t know if it was just my family, but when the kids were little all things would be taxonomically reduced in this way, all species categorised by their broadest division or phylum. Thus, all small, flying creatures (except butterflies) were “bees” while all meat was “chicken”. I wasn’t in Australia when Gough forked out $1.3m to buy a splashy, dripping painting by Jackson Pollock. I missed the Blue Poles controversy by a dozen years, not arriving here until 1985. In that time the world (your world, if you’re an Australian) had changed dramatically: you got out of Vietnam, had several tumultuous changes of government, floated the dollar, won the Americas Cup, put a woman in prison after her baby had been killed by a dingo. Heady stuff. 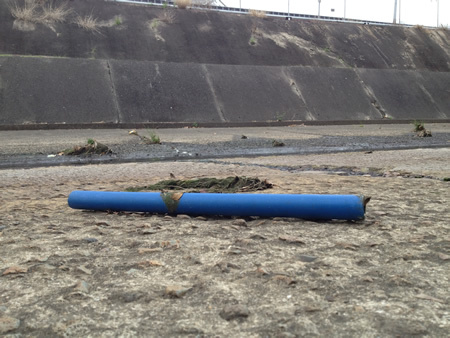 Strangely, it wasn’t really these blue poles that reminded me of 1973; it was a bunch of chokos scattered about the creek bed. Maybe “reminded” isn’t the right word. Rather, they triggered a train of thought that took me back to a winter in the early 1970s in northern England. Anyway, the train of thought was off and running by now. Thoughts of lobbing stuff around, maybe too many nearly ripe apples pinched off trees or eggs from Harry Barker’s hen huts. Or snowballs. It was about a mile walk from school to the bus stop, along rows of terraces, via the cake shop where you could get two stale cakes for a penny ha’penny. On snowy days we’d have snowball fights, but not horizontal ones. These would be fights with whoever was on the next street along with the snowballs being lobbed high over the roofs of the terrace houses to come hammering down like mortar shells on the street on other side – a big ask for a skinny-armed 12-year-old. At some point a bright spark would wrap a rock in snow and lob that over, starting a Cuban Missile Crisis-like ramping up of armaments. The snow around the rocks would get thinner and thinner until basically it was just rocks that were being thrown. Inevitably someone would get hurt or something would get broken. I remembered other rock fights. Where I lived there were lots of abandoned slate quarries, perfect for making camps. Other kids would try to “take” them, with us chucking the sharp scards of slate at them and them back at us. Old barns were great for the same kind of gang wars. We must have been absolute demons. If my son did any of this stuff I’d go ballistic! 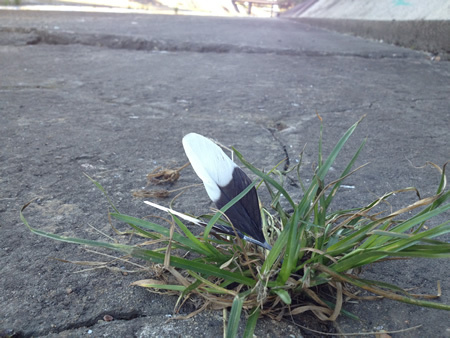 I was coming out of the gasworks, where there seems to be an exceedingly large number of dead things at the moment. Two young lads were sauntering past, a Coles freezer bag in hand. Now, I might not be the most worldly person but I knew that these lads had not been shopping for yoghurt. These freezer bags, with their padded sides and zip lids, are perfect for storing your Ironlak collection. 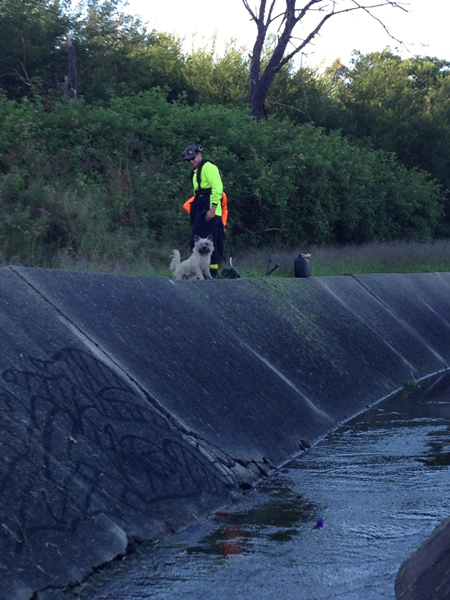 We nodded cautiously at one another and I headed downstream while they snuck off up the Chaucer Street drain towards, I presume, the Broadmeadow rail yards. A reminder that maybe not much has changed in all those years. Young males will still seek ways to put themselves in danger and generally annoy the rest of the world. As they always have. Or, if your first language is English, World Water Day. Today, 22 March, has been designated World Water Day by the United Nations. When I hear “International Year of Blah” or “World Blah Day” I tend to switch off. These things tend to smell of focus groups and ideas dreamed up in offices on the twenty-second floor of some glass-and-chrome office in Zurich or Baltimore. I haven’t done anything to celebrate WWD at the moment. 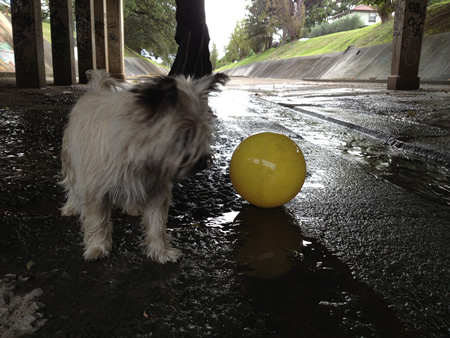 It was too drizzly and miserable this morning, and Jambo was too fixated with the bunnies in gasworks. (Question: how many litres of water does it take to make a bunny?) But the sun popped out briefly. I suppose I could always upload this pic to the official UN Flickr site. Or I could just do what I should do: log out and get on with my day’s work. 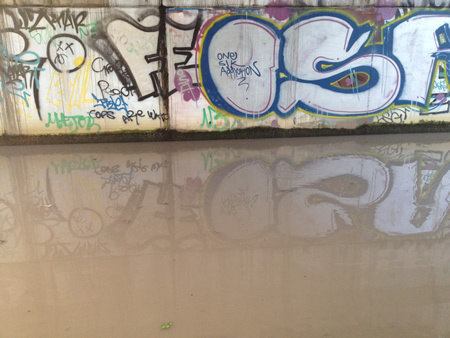 Occasionally the rain upstream is so torrential that the is turned creek the colour of milky coffee. This morning it was heavy with sediment, a slurry of washed-out topsoil from Kotara, New Lambton, Broadmeadow and beyond. In spite of the rain it’s surprisingly littery. The litter seems mostly to be stuff discarded from the Newcastle Show on the weekend: balloons, drink cups and bottles, balloons, food wrappers, balloons. 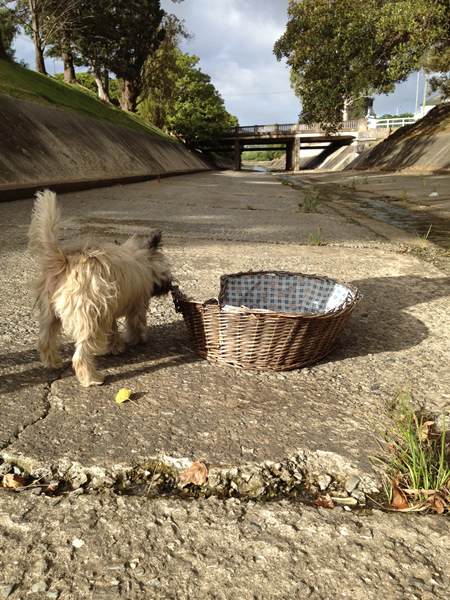 And … er … dog baskets. Perhaps it was a rejected entry from the weaving section in the Hall of Industry. 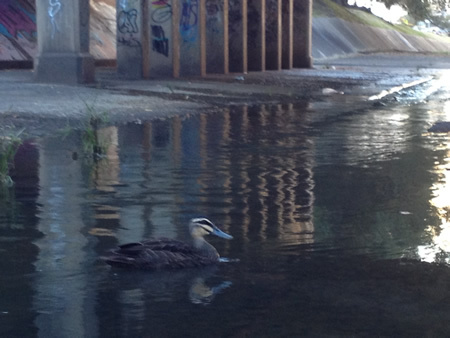 On my way back from watching the ducks by the TAFE I got chatting to the young bloke from ERM, the mob contracted by Shell to carry out its “due diligence” work; that is, checking how crappy the creek is at any particular time. The tide was on the rise and we both laughed: he’d had one eye upstream worrying about being washed away by raging floodwater when – barzingah! 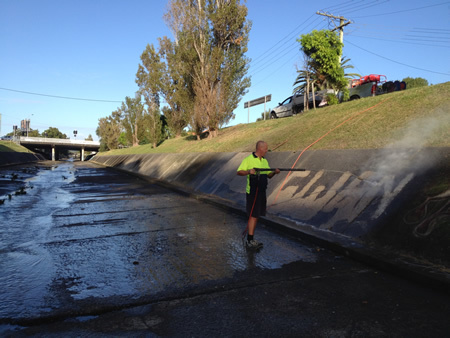 – a tidal surge from Throsby Creek had him packing up his Eski and scuttling back up towards Chatham Road bridge. And what was this? More hi-viz! 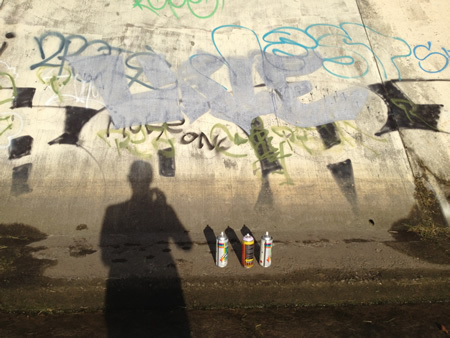 A graffiti clean-up team was working on the bankings. Apparently there had been complaints from the good folk of Newcastle who, parking in Richardson Park for the Show, were affronted by a veritable gallery of horrid tags. Yuk! I can’t help thinking that, in removing one type of graffiti, we were getting another. Some clever artists have made an art form of reverse graffiti; in fact, you can still see a neat bit of reverse graffiti on King Street, sponsored by the Pride of Place Taskforce. By evening things had calmed down, the hi-viz had packed up and gone home. 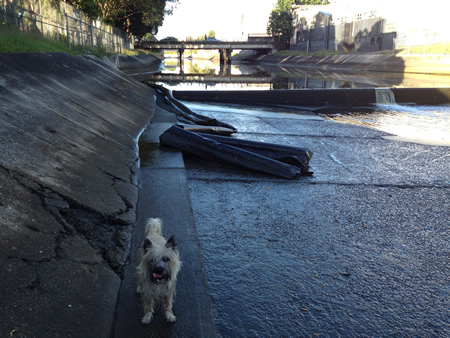 I was walking under the bridge when Old Mate cooeed out to me. If he calls out to me that’s fine, but I never call out to him – it would be like barging into someone’s bedroom. But tonight we had a yak. Every now and then he comes for a walk with us, me and Jambo, and tonight was one of those nights. (That’s him, just about to hop over the beck.) We had one of our usual broad-ranging and eclectic conversations. I never know quite what to expect. People often ask me about Old Mate. How is he? What’s he up to? Is he still there? I can assure you: he’s well, he’s up to the same old stuff, and he’s certainly still here. I like to keep an eye out, you see. It’s my due diligence. Another milestone has passed. 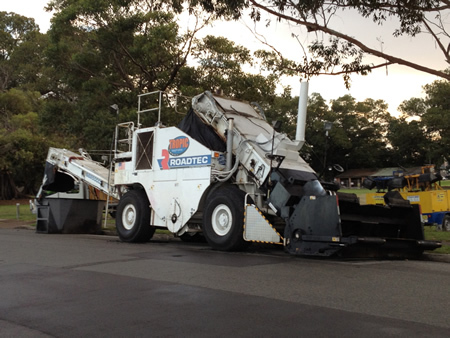 When my kids were little (like, tiny), and used to wake up (and us up) at 5 o’clock, it was a weekly ritual for us to traipse out to the front yard and wave at the bin man as he drove past in his big truck with the flashing orange light. 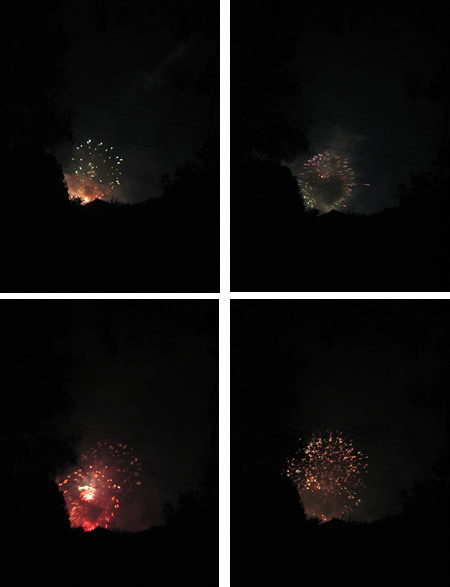 It’s not something I particularly miss, but here’s a passing milestone that I do: the annual viewing of the Newcastle Show’s fireworks from our front verandah. Neither of them even moved as the first Kaboom! rattled the window panes at 9.30 on Friday night. On Saturday night I ventured out, alone, to get a few fuzzy snapshots. Low cloud reflected the reds and greens back down over Hamilton North. 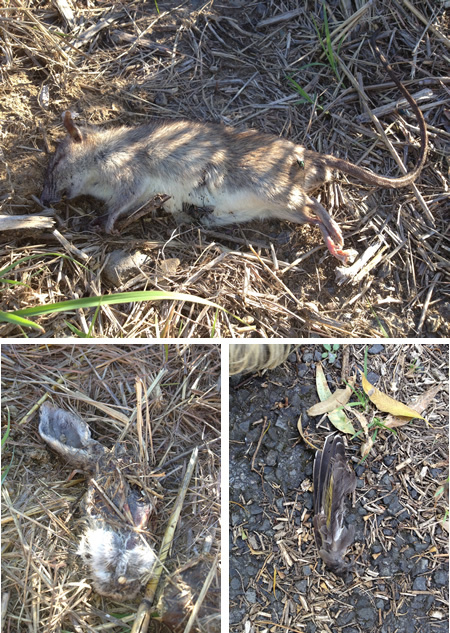 Freaked-out fruit bats chattered and circled around the Richardson Park fig trees and an acrid cloud of gunpowder drifted over the house. It’s a smell I love; it reminds of the spent shotgun cartridges that would rattle around in my dad’s jacket pocket after a windy, moonless night on the English moorland. March, the first month of autumn, has been the best summer month we’ve had. Gorgeous, mild days with cool evenings and balmy breezes. 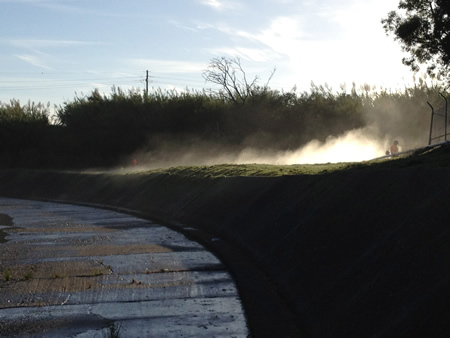 * In the mornings the dew is heavy on the long grass; when the maintenance crews slash it a mist of dew and two-stroke exhaust fills the creek in most Turneresque way. Jambo, the world’s nosiest dog, can’t resist saying hello. But around and about there is a sense of “fattening up” before the real cold times arrive. In one evening I saw three different raptors in and around the gasworks: the grey falcon was back, causing the huge flock of delinquent Indian miners that hangs around there to go into a frenzy of squawking and clacking; then a brown falcon perched on a stand of dead lantana; and then the peregrine, up high on the storage tank. Their territories and prey range must overlap and yet they seemed content to accept one another’s presence. Perhaps the onset of autumn brings with it a sense of pragmatism. This little chap turns up by the Chatham Road bridge fairly regularly. 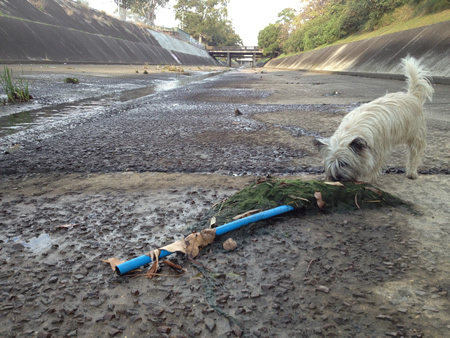 Still down by the TAFE, the litter boom was busted for a few days. 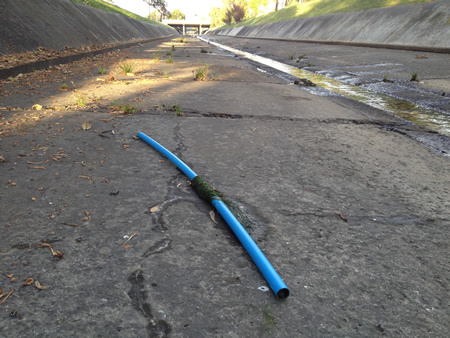 It lay coiled at the side of the creek like a massive, dead python. 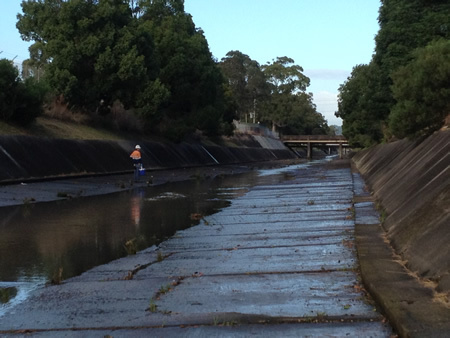 The same morning I came across a young kid sloping away up the creek. When I got closer to where he’d been I found out why he was doing the suspicious crouchy walk. I wanted to call him back, not because I was angry with him but because his tag was so utterly lame. 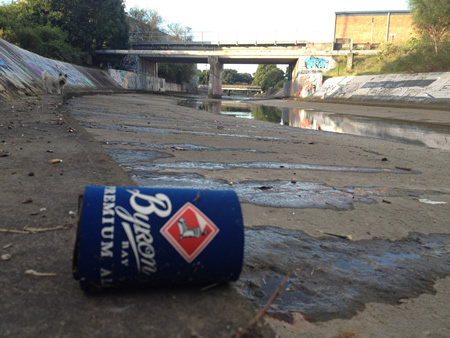 In my best Victor Meldrew voice I’d bark “If you are going to vandalise the creek then at least do the best job you can!” I took a diversion and, when I came back, the cans were gone but the tag was still unfinished. Modern youth: useless. The trees in the gasworks are covered in spider webs. The bigger webs look like guy ropes, as though they’ve been pegged into the ground and stretched tight to stop the trees from falling over. Dusk is the best time for seeing the webs and not walking dumb-headed right into them. 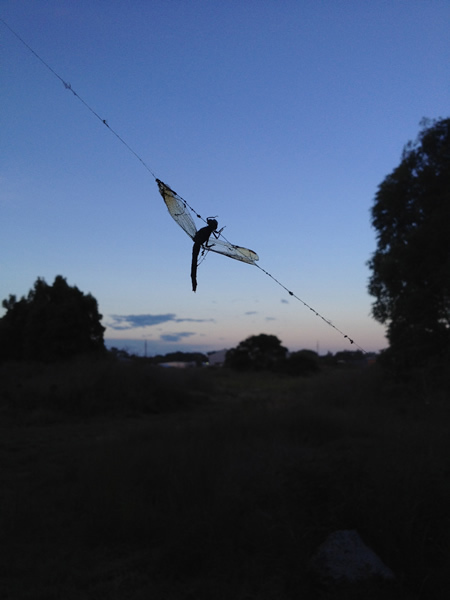 Unlike this crucified dragonfly. For over thirty years now, whenever I’ve seen a crucifixion, a painting or sculpture or icon, the image that has sprung to mind has not been that of Jesus but, annoyingly, that of Charlton Heston in the closing scene of that zombie flick The Omega Man. Hopefully now I’ll think of dragonflies. * Of course, the day after I post this it rains buckets. Nothing to do with Newcastle Show, by any chance? … different issues. Or maybe, the same issues in differently coloured wrapping paper. A friend from Alice Springs days keeps me up to date with the news from Centralia. A popular quiz night question is “Name the river that runs through Wilcannia / Dubbo / Kempsey” etc. ; it’s one that often trips people, but a good proportion of Australians know that it’s the Todd that runs through the middle of Alice Springs. The Todd River still has its natural, sandy bed and its 500-year-old gum trees, thanks mainly to the foresight of Mounted Constable WG South who, a century ago, saved them from being axed by the newly arrived colonists looking for building materials and firewood. South wrote to the Minister for the Northern Territory “The trees are a great ornament to the place and it would be a great pity to destroy them”. The trees are still under immense pressure, these days from a suite of threats including sand mining, firewood collection and root impaction by vehicles, but South’s foresight has ensured that these beautiful old giants still guard the waterway. However, the Todd River is, for many people, a place of short-term residence. As the major service town for the Red Centre, Alice attracts people from miles and miles around, people who often don’t have a bed or a room for the night. Among this group is some of the most committed and prodigious drinkers in the world. 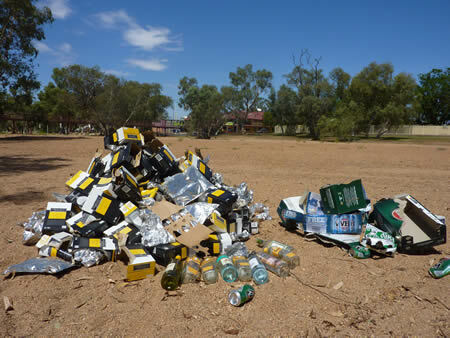 A recent collection by a small group of people found, in a 200 metre stretch of the river, the following small mountain of casks and bottles. Check out the website of the People’s Alcohol Action Coalition to find out more. 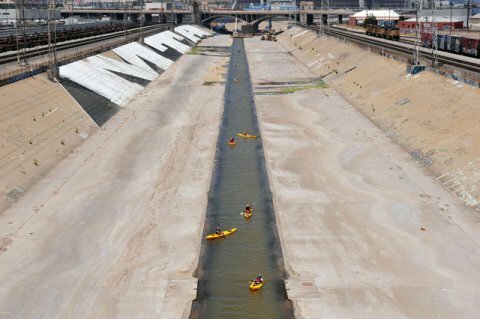 The Planetizen site also links to articles on the Los Angeles City Council’s recent approval of an update to the Los Angeles River Implementation Overlay to encourage good quality river-centric development and to begin removing some of the concrete that covers the river and its banks. It’s all food for thought, some of it heartening and some of it less so. But it is a reminder that waterways are living places that people the world over are attracted to, love and want to care for. Just like Styx Creek. I mean, how nice is this? 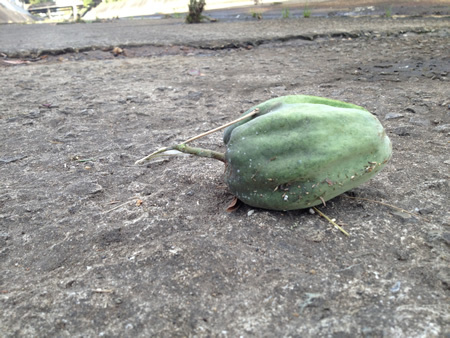 You are currently browsing the Hamilton North, NSW 2292 blog archives for March, 2012.